The annual Third Year Talks took place on Tuesday 29th May, so Bruno, Hannah and Isabel, as third year students had a chance of presenting their work. The event, sponsored by Eli Lilly, involved 38 students from TCD, UCD and DIT who presented their research in the Hamilton Building on the Trinity Campus. Isabel talked about her btp-based metal ion complexes during the Inorganic Chemistry session; Hannah presented her work with bypiridine derivative complexes of d and f metal ions in the New Ligands session; while Bruno talked about his work on f metal ion complexes as indirect probes of peptidic phosphorylation in the Analysis of Biologic session. Our congratulations go to all the students who participated, and especially to Bruno, Hannah and Isabel for their great job representing the TG group! Congratulations to Dr Fergus Poynton, who was formally presented with the RIA Young Chemist Prize today. The prize is awarded annually by the Royal Irish Academy for the most outstanding chemistry thesis in Ireland. Fergus won the prize in March for his thesis “Spectroscopic Investigations into the Excited-State Processes and Reactivity of Ruthenium(II) Polypyridyl Complexes”, he has since won one of the five IUPAC-Solvay International Awards for Young Chemists, and will receive the prize at the 46th IUPAC World Chemistry Congress in São Paulo this July. In a special ceremony in the Academy, the prize was presented by Prof. Pat Guiry, Vice-Chair of the Physical, Chemical & Mathematical Sciences of the RIA. The ceremony was also attended by Fergus’ family and friends, as well as collaborators Clive Williams, TCD and Susan Quinn from UCD, co-supervisor John Kelly and his colleagues from the Donnelly research group in the School of Medicine. Örn Almarsson, Head of Formulation of Moderna Therapeutics in Cambridge, Massachusetts, gave a lecture about his work titled “Messenger RNA: A Novel Therapeutic Approach”, today. Moderna Therapeutics have demonstrated the possibilities offered by mRNA-based treatments, establishing partnerships with Merck, receiving awards for their research achievements and raising over $1.1 billion in equity financing. Örn was invited to speak to TBSI by Thorri, of whom he is a longtime friend. It was a pleasure to have him talk about his work and provide a unique insight into the world of cutting-edge industry research. On the afternoon of Thursday 1st of December, the Trinity Biomedical Sciences Institute (TBSI) will be holding a half day symposium where several of the most important chemists from across the UK and Ireland who have had the chance to work with or just be friends with Professor Philip A. Gale. The Symposium will be free of charge and open to the public so everyone feel free to join us for it in the Tercentenary Hall at TBSI starting from 12:30. See you on Thursday! A. P. de Silva, longtime friend and former supervisor of Thorri, and professor at Queen’s University of Belfast, gave a lecture about his work on “Fluorescent sensing and logic systems” today for the first DU Werner Chemical Society talk of the year. Group members Hannah and Isabel – who are also committee members of the Society – helped organise the talk. A. P.’s work on fluorescent sensors has developed into a range of blood gas and electrolyte analysers, sales of which by Roche, OPTI Medical (for human health case) and IDEXX (for animal use) have surpassed $530 million, and saved countless lives. As always, it was both a pleasure and an honour to have A. P. as a guest at Trinity and an enjoyable and unique experience to participate to one of his talks. Looking forward to the next time! Pictured are Prof. Gunnlaugsson and Dr. Surender following the ceremony. 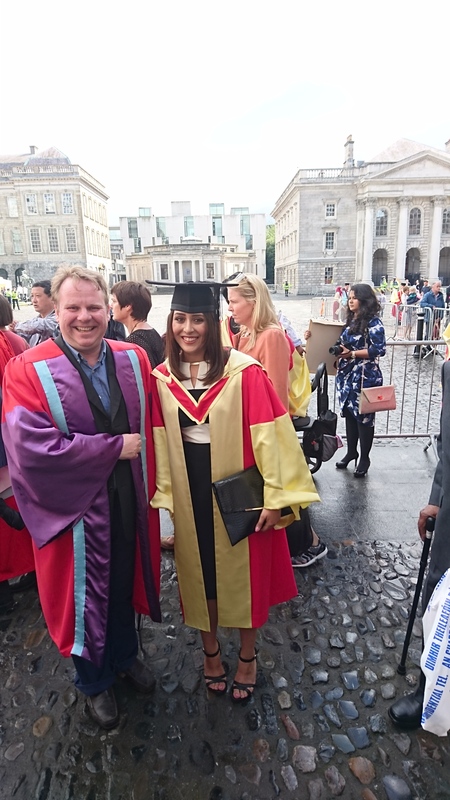 As part of the summer commencements at Trinity College Dublin, Dr Esther Surender was conferred with her PhD degree in the Public Theatre. A number of honorary degrees were also awarded in the same ceremony, including the Nobel Prize winner Peter Higgs.